If you’re looking for a home improvement project to tackle this fall, add painting your home to the top of the list. If you’re looking for a home improvement project to tackle this fall, add painting your home to the top of the list. There are many benefits to painting in the fall, and we’ll cover seven of those reasons below. Gather your favorite swatches of paint and block out the clearest days to head outside. With the fall season comes mild weather. Take advantage of the cool days and clear skies for exterior painting. The coolness won’t only be more comfortable for you but it provides the ideal atmosphere for your paint to dry and look its best. As your flowers and plants start to go dormant for the winter months to endure the harsher weather that’s soon to come, you won’t have to worry about doing any damage to your landscaping. Place your ladder anywhere you need it to be without disturbing your plants and flowers. The busiest season for exterior home projects is spring. You’ll beat the rush by completing yours during a less popular time. You’ll be able to head to your local hardware store and get all your supplies without waiting in long lines and while the selections are plentiful. 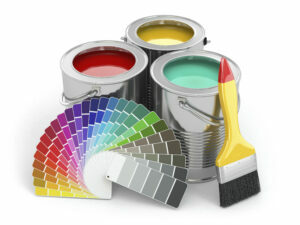 Painting provides weather protection, especially if you choose paints with inherent protective properties. It acts as a barrier between your home and the harsh temperatures of precipitation of the forthcoming season. Having lower humidity in the air will give your paint a better chance to dry more evenly and adhere to the surface better. Seasons with higher humidity create moisture in the air that gets between the surface of your home and paint, which can cause premature flaking and affect the brilliance of the color. As the housing market will begin to pick back up in the coming spring, you’ll already be prepared to enter with your fresh renovations. Increase the value and curb appeal of your home in one of the simplest ways. With the start of the fall season also comes the start of the school year. Having the kids busy all day learning and participating in after-school activities, you’ll have the time and space to complete your painting project. This entry was posted on Friday, September 15th, 2017	at 3:35 pm	and is filed under Painter	. You can follow any responses to this entry through the RSS 2.0	feed. Both comments and pings are currently closed.